ToysRUs how's joins the ranks of the approved retail stores to sale the iPad 2. They have included a full page advertisement flyer or circulator in the April 17, 2011 Sunday Free Press here paper in Metro Detroit. They indicate that the iPad 2 is in "select stores". 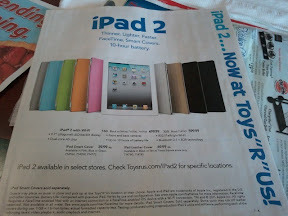 The flyer points readers to their site at http://www.toysrus.com/ipad2 for specific locations. 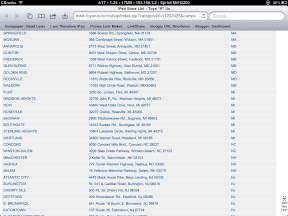 Here in Michigan there are 8 locations that are on the list. Including the store here in Novi. I called Sunday at 1:40pm and of course they were sold out. "We received a limited supply", Heather in the Electronics department indicated. "We don't know when we will get new units in" she added when pressed about availability of the iPad 2. So you have yet another place to stand in line at in the morning to hope you will get an iPad 2. Once the supply issues are cleared up, it will be a welcomed site to see alternative locations for the purchase of the popular device. Until then, the only guarantee you will walk away with is either tolerance or frustration.